Have I ever mentioned that I have quite a large wardrobe of outfits? Seriously, my Mama buys me more clothes than she buys herself… It’s seriously sad, but I guess I don’t mind… Most of the time. 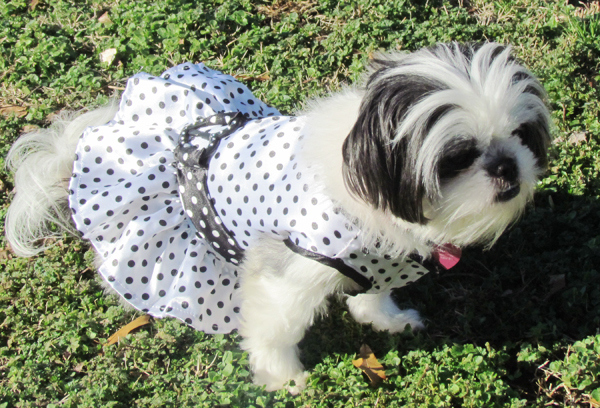 But this time, Mama didn’t get me this new dress. Santa Paws put this in my Christmas stocking. Isn’t it pretty? 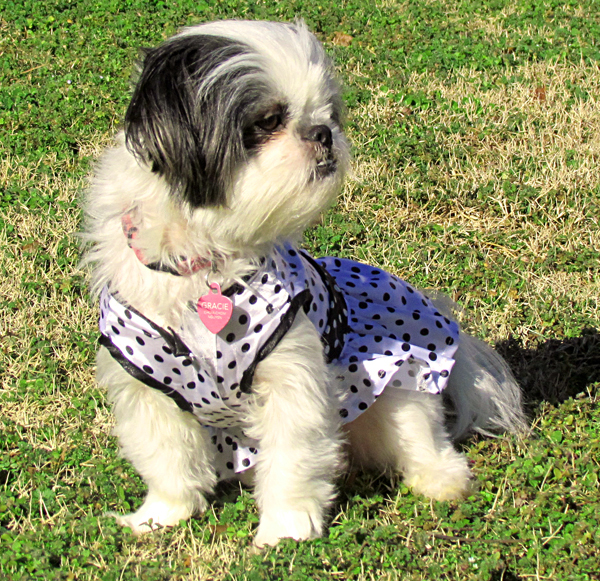 This black and white polka dotted dress has a little belt around the waist. 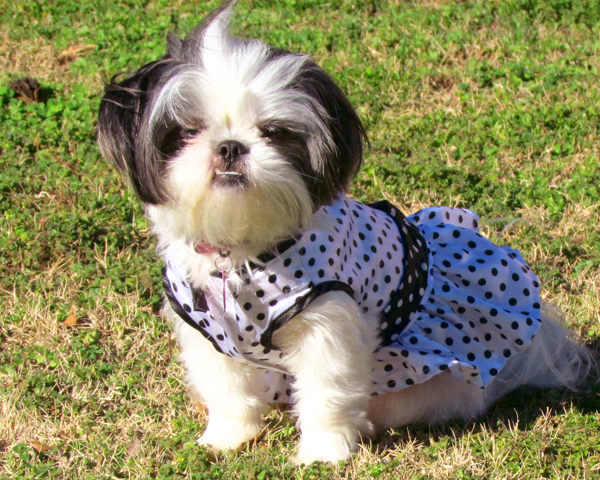 Makes me look like a Shih Tzu Diva, doesn’t it? 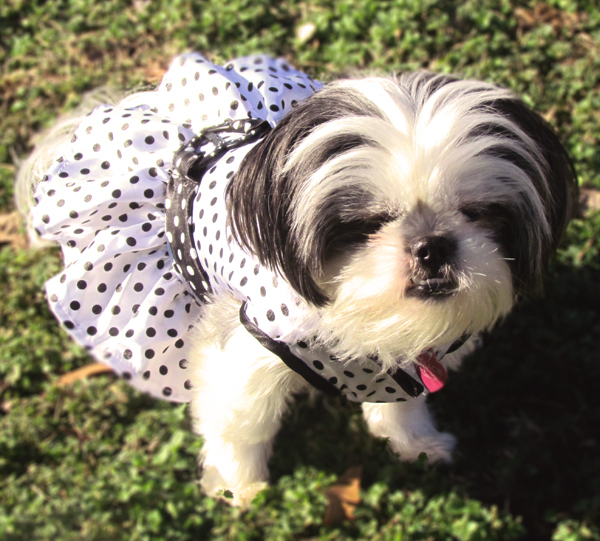 I look pretty darn cute, if I have to say so myself. What I really like about this dress is that it velcros around chest.. so unlike other annoying outfits, Mama doesn’t have to slip it over my head. She just puts my paws through the arm holes and velcrows it on me. Doesn’t hurt, and it’s so easy to put on and take off. The fabric is also very light, so it’s not too hot on me. Though it’s already winter, we still have fall-like weather here in northern Alabama/southern Tennessee. Here I am looking up at Mama, wondering why she is snapping my photo once again. The wind likes to blow my hair around, and it makes my face look chubby and just so kissable. Don’t you think? Here is the dress in all its beauty. What do you think? 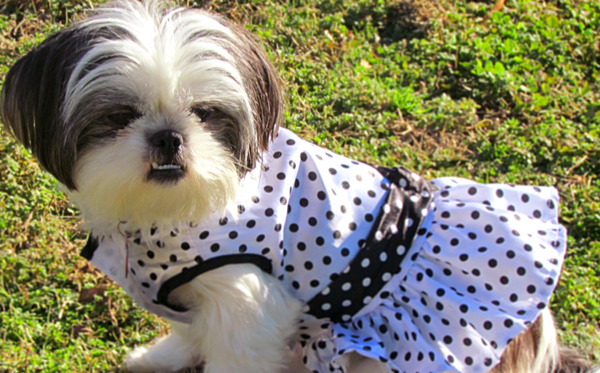 Am I the most cutest, stylish Shih Tzu diva you ever did see? I like to think so. 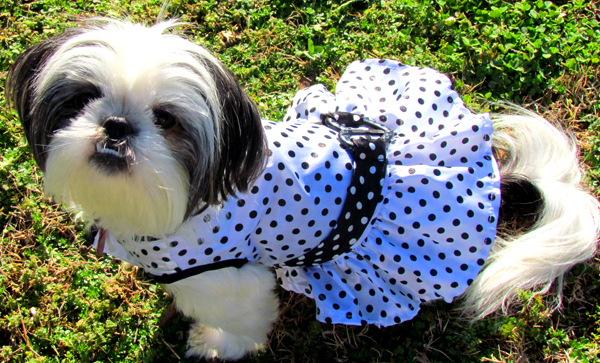 That is an adorable dress! Definitely very stylish, though I have been threatened with certain death if I ever decided to put that on one of the cats.